What are General Liability Class Codes? General liability class codes are groups of numbers that insurance companies use to classify businesses into categories of risk, to aid them in assigning the appropriate rate, coverages, and exclusions for GL insurance. Naturally, different types of businesses are vulnerable to various kinds and degrees of risk. General liability class codes enable insurance companies to group insureds based on the type of work being performed and to collect statistical data affecting how they will underwrite that line of business. Lookup general liability class codes. 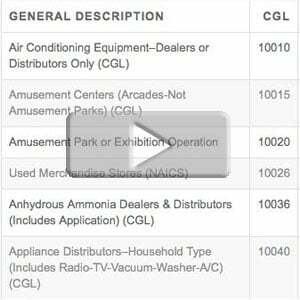 View online index of GL class codes. Learn how businesses are classified to general liability codes. View the USA businesses database. Want to target businesses by general liability class code? Download the USA Business Database. Online General Liability Class Codes are shown below (Index only). Continue reading for information regarding how to obtain authoritative underwriting material for general liability insurance. A business consultant (ISO CGL Code 41677) is more vulnerable to errors that might harm a client’s revenues, whereas a carpenter (ISO CGL Code 91340) is more prone to the risk of personal injury. Since each of these industries possesses different risk exposures, they need different types GL classifications. 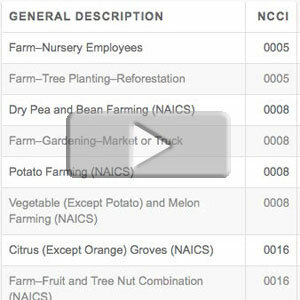 General Liability classifications categorize businesses according to the service they provide and the hazards and risks that are unique to those services. While insurance companies use GL codes to approve and rate businesses, they are also used to deny certain coverages as well. An example of operations not covered is called an exclusion. Exclusions limit the insurance company’s liability for activities that fall outside of the insured’s classification. For example, if a residential carpenter (ISO CGL Code 91340) frames a residential house that is faulty and incurs damages, the business is covered. If however, they incur losses as a result of framing a building that exceeds three stories in height, the business is not covered because this is excluded from that particular GL code. For example, if a residential carpenter (ISO CGL Code 91340) frames a residential house that is faulty and incurs damages, the business is covered. If however, they incur damages as a result of framing a building that exceeds three stories in height, the business is not covered because this is excluded from that particular GL code. General liability is the broadest, most common form of insurance purchased by businesses, protecting them from a variety of claims. General liability protects businesses aginst risks such as personal injury, property damage, and other types of bodily harm that result from the business operations. In the event that the business is sued, GL insurance protects them against many hazards and risks. If a lawsuit is brought against a company with a GL policy, the insurance company pays for legal fees, losses, and damages that are incurred as a result of the lawsuit. While visiting your business, a customer trips on a step and is injured. An employee of your residential electrician service accidentally leaves the water running, causing damage to a customer’s home. A class action lawsuit is filed against your insurance agency, alleging that advertisements constituted misleading information. Looking for a GL Class Code? If you are looking for a GL class code list online, you can find them many places online–such as the official insurance agency associations for most states. Many other websites post a general index of class codes that are important for their viewers, including insurance carriers, brokers, and agencies. 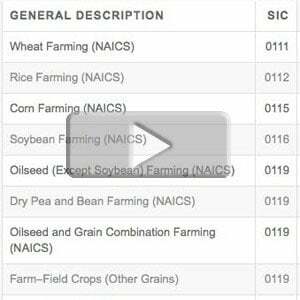 However, these lists (Such as the list below) only provide a general index listing. For underwriting purposes, you will need a detailed, accurate, and authoritative guide – the PAAS General Liability Classification Guide. 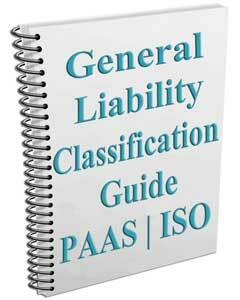 The General Liability Classification Guide is available through PAAS on http://www.verisk.com/iso.html. Insurance companies assign general liability class codes based on company industry and the type of work performed. The rates developed the insured’s business classification are applied to the gross sales, square footage, or payroll as a rate per $1,000, depending on the industry. Liability insurance rating is based on gross sales for most businesses except for construction, where it is often based on both employee payroll and sub-contractor payments. To locate NCCI class codes, click the image below. To view the SIC Code List, click the image below. 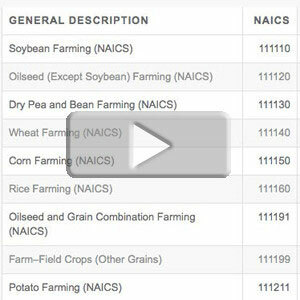 To view the NAICS code list, click the image below. To view general liability class codes, scroll down. After following the link below for ISO CGL class codes, you can press “Control” + “F” to search for a specific number or keyword. 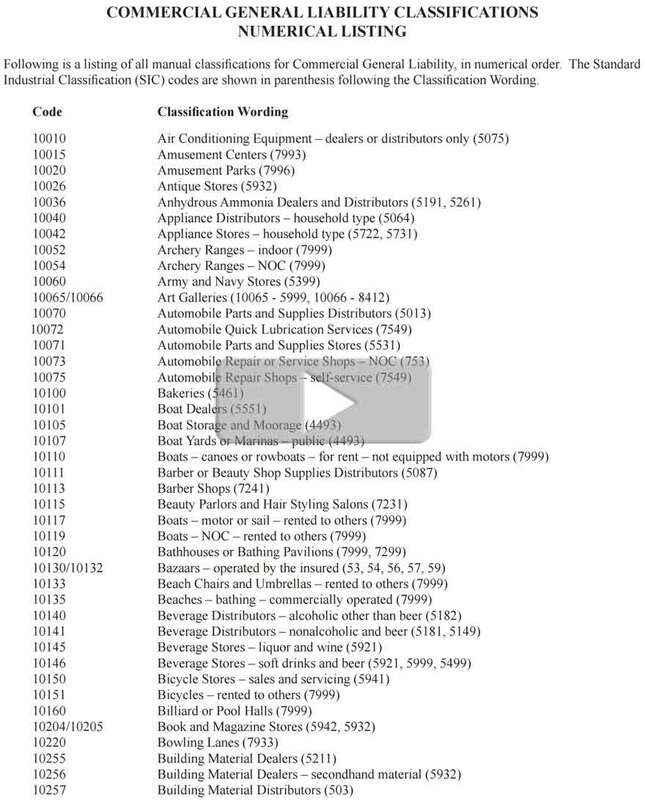 11167 Concessionaires – check room, shoeshine, or toilet concessions in hotels, restaurants, railroad stations, etc. 91588 Contractors – subcontracted work – in connection with bridge, tunnel or elevated street or highway construction, reconstruction or repair. Users can press “Control” + “F” to search for a specific number or keyword.